You are here: Home / Why Climb? You may be thinking, “Why climb to the summit of Mt. Kilimanjaro?” It’s simple. Mt. Kilimanjaro is the world’s tallest freestanding mountain. It reaches an outrageous 19,341 feet. That’s nearly 4 miles upward. This mountain is large and we feel that it’s a perfect representation of the enormity of the water problem in Malawi, Africa. So we’re climbing it. The purpose of this climb is to raise awareness and funds for clean water in Malawi, Africa. We’ve assembled a great volunteer team of fundraisers who will climb to the top of Mt. Kilimanjaro this summer. Topping out at an elevation of 19,341 feet, the mountain poses numerous physical challenges but each climber is extremely devoted to repairing wells in Malawi and determined to rise to the top. Child Legacy International has been repairing water wells since 2008; even though they have repaired more than 4,000 broken pumps in Malawi — which impacts almost 8 million people (more than 45% of the country’s population) — there is still a great need. Between 35%-40% of handpumps in the rural areas are non-functioning, meaning that millions of Malawians are having to find alternative water sources, and most of those sources are unprotected. We have seen it first hand, visiting primary schools and hearing teachers report student death or poor attendance due to bad water. We feel that those who can help, should, and in the case of well repair, a little goes a long way. Just one dollar provides clean water for 1.7 people for up to 5 years! The climb is quickly approaching and we would love for you to take part in it. Our climbers are gearing up for this 8-day mountain climb, and your financial and prayerful support is what will get them through it! In doing so, you will save entire villages from one of the world’s leading causes of death – waterborne disease. Click here to see an album of water well repairs. 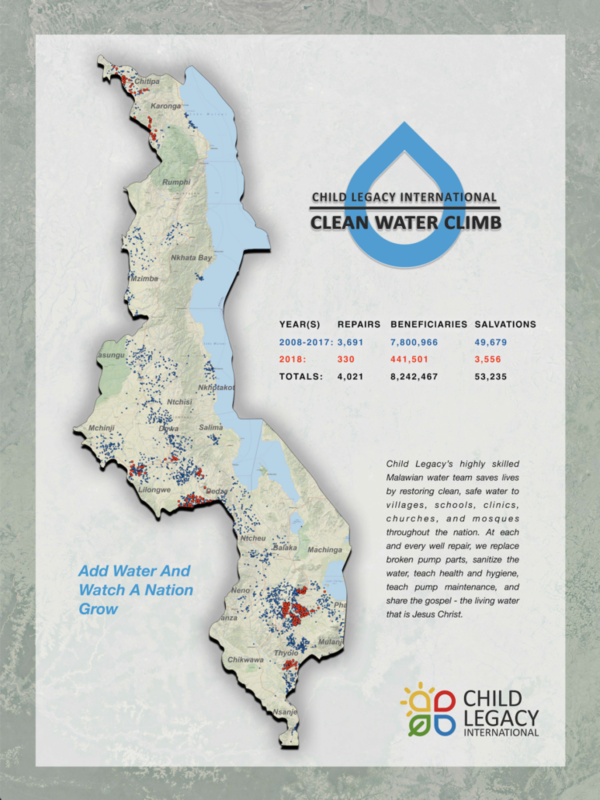 Child Legacy climbs to bring clean water and Living Water to the people of Malawi. You may be thinking, “Why climb to the summit of Mt. Kilimanjaro?” It’s simple. Mt. Kilimanjaro is the world’s tallest freestanding mountain. It reaches an outrageous 19,341 feet. That’s nearly 4 miles upward. This mountain is large and we feel that it’s a perfect representation of the enormity of the water problem in Malawi, Africa. So we’re climbing it!